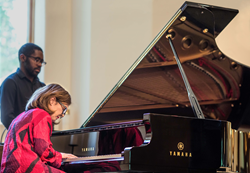 Anne-Marie McDermott performs on the Yamaha S7X premium piano at Vail Interfaith Chapel during the Bravo! Vail Music Festival, one of the world’s premiere music festivals. “What I love so much about the SX series pianos, is that it has such a clear sound, so playing Bach on this instrument is a joy. You practically don’t have to play it, it almost plays it for you,” says Anne-Marie McDermott. The Yamaha S7X premium piano makes its public debut at the Bravo! Vail Music Festival, one of the world’s premiere music festivals, in Vail, Colorado, June 22 – August 4, 2017. An instrument of rare perfection, the S7X is crafted from exquisite materials to exacting professional and artistic standards, culminating with its completion in the skilled hands of expert piano craftsmen in the Yamaha concert grand piano workshop. It is part of the SX Series, the first acoustic pianos to incorporate the Yamaha Acoustic Resonance Enhancement (A.R.E.) treatment in its piano rims, generating the warm, deep and expressive tones that many artists seek. The S7X is being showcased at the Vail Interfaith Chapel, in performances featuring Anne-Marie McDermott, Jenny Chen and Chelsea Wang. For seven consecutive years, Yamaha has provided pianos to the Bravo! Vail Music Festival, the summer home of the New York Philharmonic, the Philadelphia Orchestra and the Dallas Symphony, which have presented “music in the mountains” to enthusiastic audiences for nearly three decades. Beyond the S7X, the Yamaha fleet of instruments featured in this summer’s event includes a CFX concert grand piano and a CFIIIS concert grand piano, as well as a GC1TA and AvantGrand N1 and N2 pianos, to be used for artist practice and rehearsal. In 2011, Yamaha artist Anne-Marie McDermott became the third artistic director in Bravo! Vail’s history, and has since been lauded for bringing a fresh perspective and a return to the festival’s chamber music roots, while integrating classical favorites and new works, in an inclusive, fun and friendly atmosphere.